DM-1620 from Mobile Mark is designed for mobile surface mounted applications with compatibility for Iridium® communications. Specifically, this antenna operates in the frequency range of 1616-1626.5 MHz with 3 dBi gain. 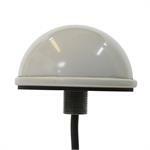 It uses the popular DM style ASA plastic radome that helps protect the unit against harmful UV rays. It is also IP67 rated for dust and water ingress. MobileMark SM-1620/1575 Iridium® & GPS combination surface mount antenna has been certified by Iridium Communications, Inc. for commercial use in connection with the Iridium communications systems.